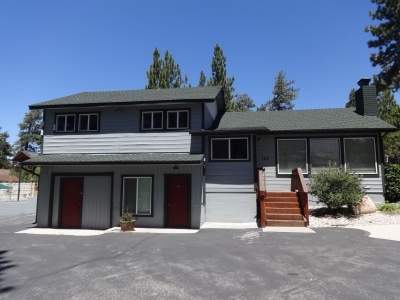 This is a list of Vacation Rental Homes & Cabins in Big Bear. Feel free to just browse through the homes or you can enter check-in and check-out date to check availability. 1 &amp; 2 Bedroom 2 story medium size historic cottages. 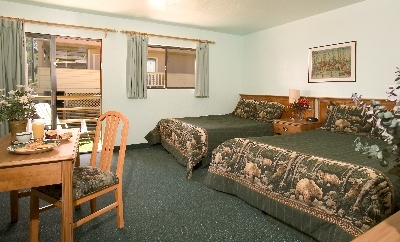 2 Bedrooms with queen, full and twin beds (#7 &amp; #19). 1 Large loft bedroom with 2 queen and 2 twin beds(#24). 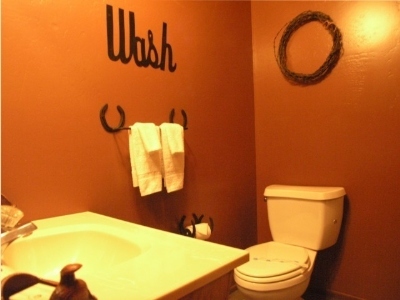 Full baths with tubs and showers. Rock fireplace in Living rooms. Full kitchen and dining areas. 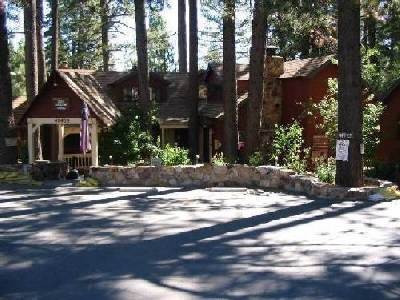 Sleeps 4 to 6 adults. Private patio areas with BBQ. Private parking. Pet friendly with fenced pet areas. 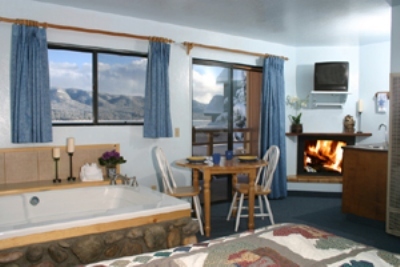 All resort cabins or cottages are AAA approved and include cable TV &amp; VCR. Kitchens are fully furnished with all of the amenities. Linens, towels and daily maid service are provided. Includes #7 Knotty Pine, #19 Mountain Hideaway and #24 Bear Hug. 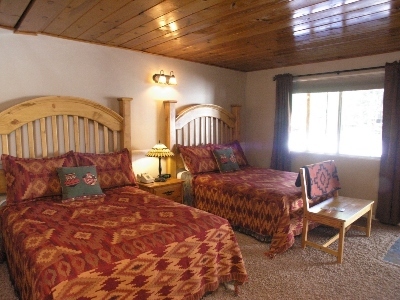 2 Bedroom 2 story historic cottages with jacuzzi or spa room. 2 Bedrooms with queen, full and twin beds. Bath and private jacuzzi tub or spa room. Rock fireplace in Living room. Full kitchen. Dining area. Sleeps from 4 to 7 adults. Patio area with BBQ. Cottage #10 is Pet friendly. for resort property and each cottage location. 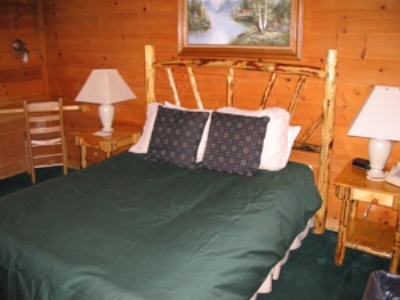 All of our cottages and cabins are AAA approved and include cable TV &amp; VCR &amp; DVD. Kitchens are fully furnished with all of the amenities. Linens, towels and daily maid service are provided. Includes the spa cottages: #10 Lazy Days and #16 Koala Bear Manor. 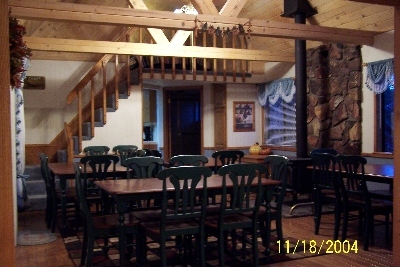 4 Bedroom Group Lodge is on the Lake side of the property, but closer to the road. 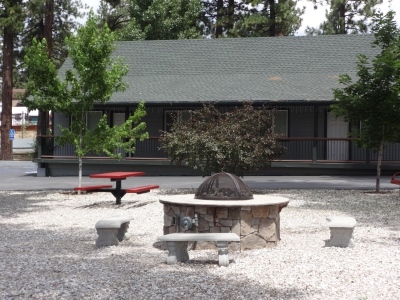 This big cottage lodge building has all amenities, and is an enclosed compound that is pet friendly. *4 Fireplaces *Full Kitchen and separate Bar *Sleeps 12 to 14 *Large Patio with BBQ's A large group suite. 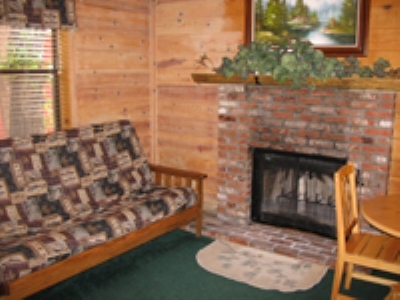 Group cottage has large flat screen TV including cable, DVD &amp; VCR. Kitchens are fully furnished with all of the amenities. Linens, towels and daily maid service are provided. 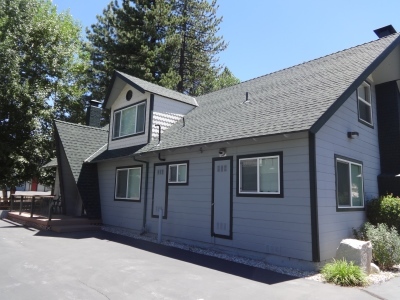 Includes large fenced patio areas on both sides of this big cabin. 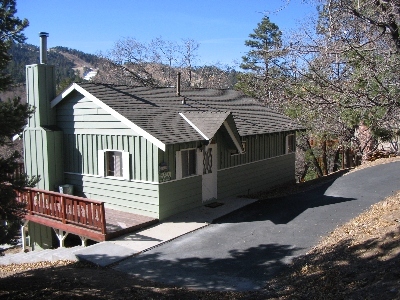 Historic studio cottages with Jacuzzi and kitchen. Full bath with Large 2 person Jacuzzi tub. 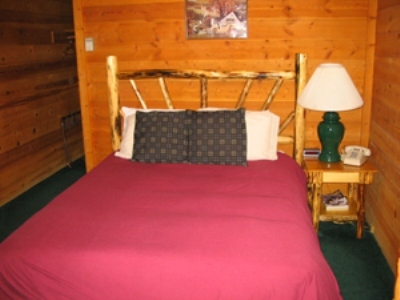 Queen bed and queen futon in cabins #14 &amp; #18. Rock woodburning fireplace. Full kitchens. Sleeps up to 4 people. Private patio areas with BBQ. Private parking. No pets allowed in these jacuzzi cabins. 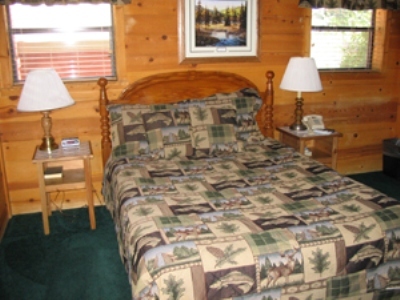 All cottages and cabins are AAA approved and include cable TV &amp; VCR. Kitchens are fully furnished with all of the amenities. Linens, towels and daily maid service are provided. Includes spa cottages #14 Bear Hug and #18 Grizzlys Den. Private large 2 story cottages with 2 master bedrooms. 2 Large bedrooms with 2 beds in each, queen and king. Cottage #23 only also has queen futon and will sleep up to 10. Full baths with tub and shower. Rock fireplace in large Living room. 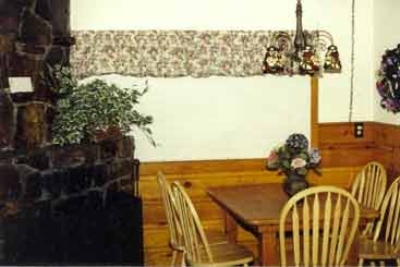 Country kitchen and dining rooms. Easily sleeps up to 8 adults. Private patio area with BBQ. Private drive. 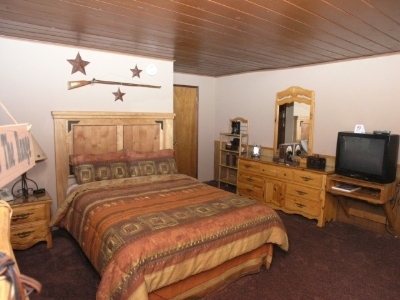 All cottages are AAA approved and include cable TV &amp; VCR &amp; DVD. Kitchens are large and fully furnished with all of the amenities. Linens, towels and daily maid service are provided. Includes all of these cottages: #8 Bearskin Hollow, #9 Bear's Den, #21 Shaggy Bear, #22 Beaver's Den and #23 Cottonwood Cottage. 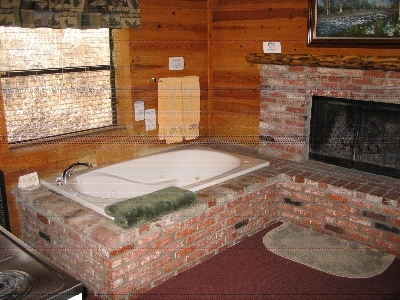 1 Bedroom historic cottages with Jacuzzi or Spa room. Bedroom has king or queen beds(or both). Bath and private jacuzzi or spa room. Rock fireplace in Living room. Full kitchen and dining areas. Sleeps up to 4(#5) or 6(#6). Pet friendly with fenced pet yards. Patio areas with BBQ. Private drive and parking. 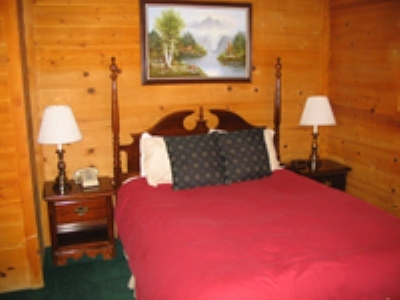 All cottages are AAA approved and include cable TV &amp; VCR &amp; DVD. Kitchens are fully furnished with all of the amenities. Linens, towels and daily maid service are provided. 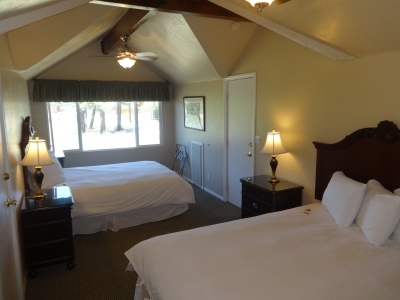 Our Largest premium historic Resort Cabin. *7 Private Bedrooms that will easily accommodate 4 or more families, or a large group up to 23 persons in this beautiful Tri-level Mountain Retreat. 3 Bathrooms in main cottage and 1 in downstairs bedroom next to bonus/game/meeting room. Large 23 person Dining Room. Large country Kitchen with multiple appliances and all the amenities you need. 3 Wood Burning Fireplaces. Large Living area with space for 40. Large Deck with Garden &amp; Waterfall. Ask about advance set-up of separate bonus and game room with pool table, card tables and foosball on the ground level. For groups: set-up available for meetings and weddings too. AAA approved and Diamond rated. Close to lake on an entire acre of land. Not a pet friendly cabin. 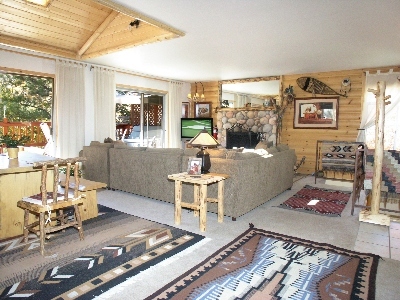 #28 Golden Bear Manor, the retreat cottage, also has 2 DVD players and three TV's. All linens, towels and daily maid service are provided. Cozy Private historic cottages. Bedroom with queen bed. Bath. Rock fireplace in Living room area. Futon in Living room area. Full kitchen and dining areas. Sleeps 3 to 4. Patio areas with BBQ. Private drive and parking. Pets not allowed in these cottages. 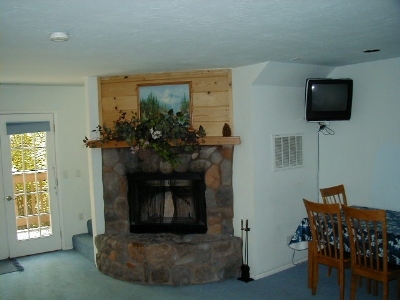 All cottages are AAA approved and include cable TV &amp; VCR. Kitchens are fully furnished with all of the amenities. Linens, towels and daily maid service are provided. 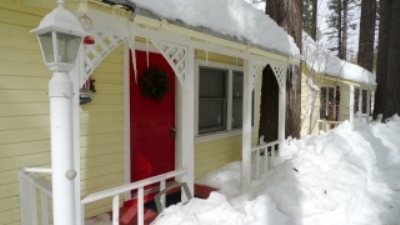 Includes cottages: #20 Mountain Shadows and #27 Fuzzy Bear. Private historic 2 story cottage with 5 bedrooms. 3 bedrooms with queen and full beds, 2 bedrooms with queen and twin beds. (one bedroom is downstairs). 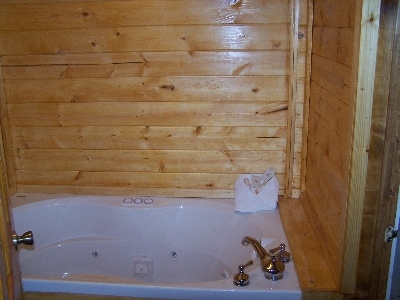 2 Full Baths with Jacuzzi Spa tubs in both baths. Large Living room with brick fireplace. Large country kitchen with Large Dining room with 2 tables. Sleeps 14 to 17 ( One of the largest resort cabins). Patio area with BBQ's. Private parking for 4 cars. Not a pet friendly cottage. This cottage includes cable TV &amp; VCR/DVD player. 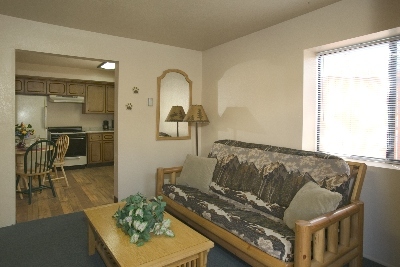 Kitchens are fully furnished with all of the amenities at our AAA approved Diamond rated 4 season resort. Linens, towels and daily maid service are provided. 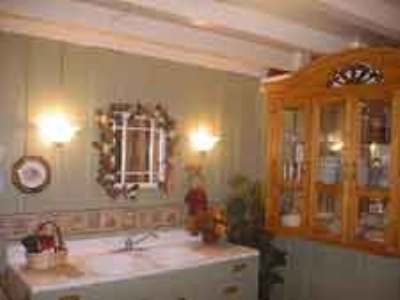 Private historic Studio cottages #12 and 15 *Queen bed *Full Bath, with large jacuzzi for two *Brick Fireplace *Small Kitchenette *Love Seat or dinette *Sleeps 2 *Picnic area with BBQ *No pets allowed in this cabin. 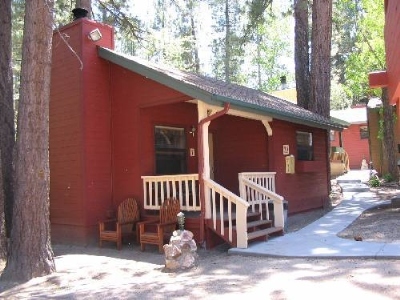 All of our Big Bear resort cabins are AAA approved and include cable TV &amp; VCR. Kitchettes are fully furnished with all of the amenities. Linens, towels and daily maid service are provided. Cowboy rodeo theme. 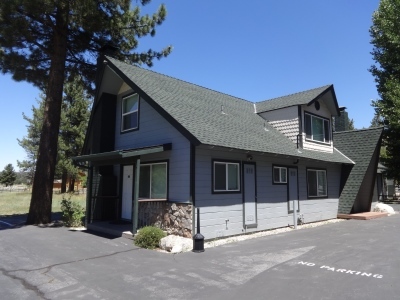 one bedroom with queen size bed, 3/4 bath, livingroom with queen sofa bed, wood burning fireplace, full kitchen, and dining area. Cowboy rodeo theme. Queen size bed, sitting area, 3/4 bath, in room coffee maker. Leaf themed room. 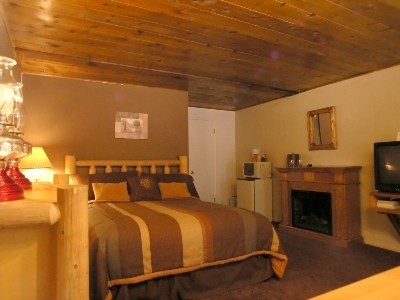 Queen size bed, 3/4 bath, sitting area, electric fireplace, microwave, fridge, and in room coffee maker. 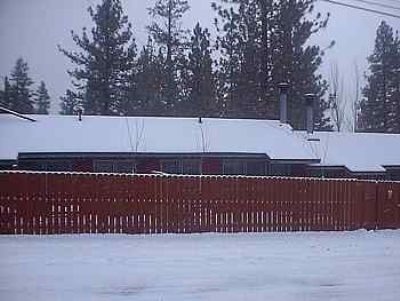 A full kitchen,&nbsp;Queen Bed, wood-burning fireplaces, a heart shaped large spa hot tub&nbsp;in the living room area.&nbsp; Black Bear Cottages &nbsp;has 5 cabins, all woodsy and beautiful. They sleep from 2 to 22, so bring everyone! 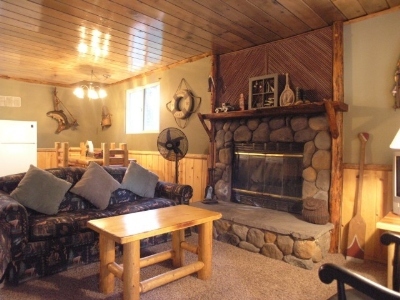 Cabins have wireless internet and cable TV. Linens and supplies are provided. Charcoal BBQs are available. 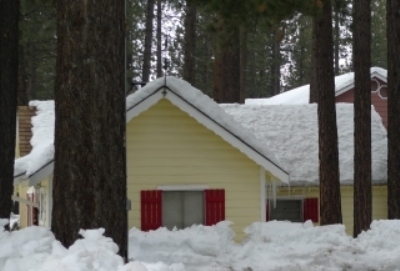 The cottages are located on Moonridge Road, 1/4 block from the Ski Shuttle parking lot and right down the street from Goldmine Lodge. Choose your fun near the slopes. 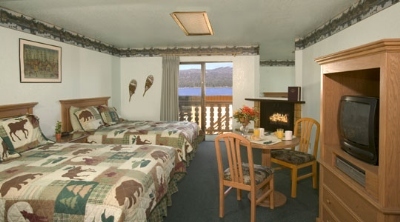 Low rates all year long enable you to enjoy a cabin with deluxe amenities without breaking your budget. 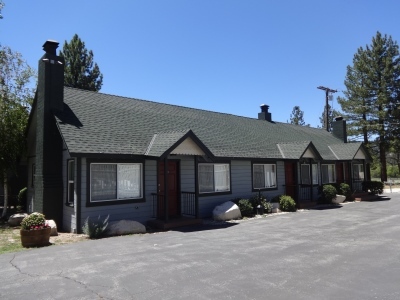 Features include a 2 bedroom (Unit #5), two 1 bedroom cabins (Unit #3 &amp; #4) and two studios with indoor jacuzzi tubs (Unit #1 &amp; #2). Deer theme. 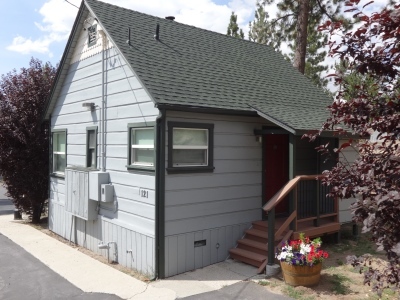 One bedroom with a queen size bed, full bath, living room with a queen size sofa bed, wood burning fireplace, full kitchen, and a dining area. This is&nbsp;a suite with a bear theme. It consists of two queens in a separate bedroom,&nbsp;queen size sofa sleeper in the front room, living room&nbsp;with a wood burning fireplace, flat screen TV, full kitchen, dinning room, in room coffee service and a 3/4 bath. This is a two story unit in our main Lodge building. Upstairs there are two bedrooms, one with a queen size bed, the other with 3 queen size beds, a full bath and TV/VCR. 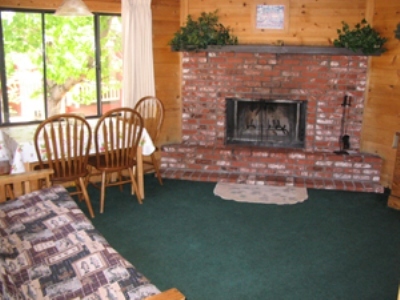 Downstairs there is a double futon, a full bath with soaking tub/shower, full kitchen, wood burning fireplace, cable TV. Non-Smoking. No Pets Allowed. This unit has an extra $50 cleaning fee over the room rate. This additional fee is due at check-in. 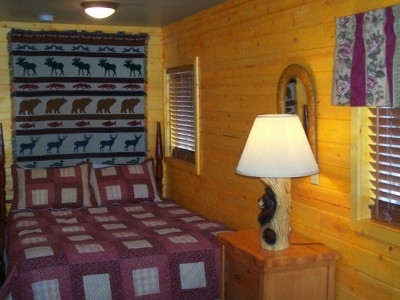 This one bedroom stand alone cabin is next to our common area and playground. 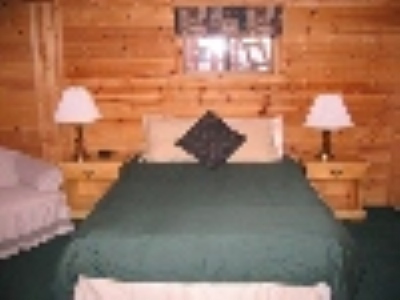 Amenities include a queen sized bed in the bedroom and a doulbe futon in the livivng area, This cabin has an open floor plan to the bedroom, kitchenette, wood burning fireplace, full bath and cable TV with a VCR. Non-Smoking. No pets allowed. This studio has a common wall with 106. 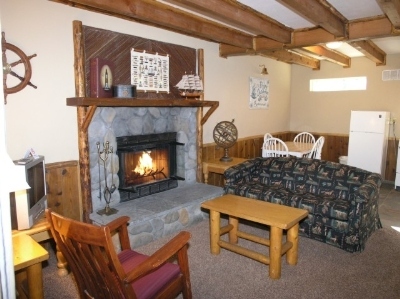 Amenities include a queen size bed, wood burning fireplace, full bath, minifridge, cableTV. Non-Smoking. No Pets Allowed. 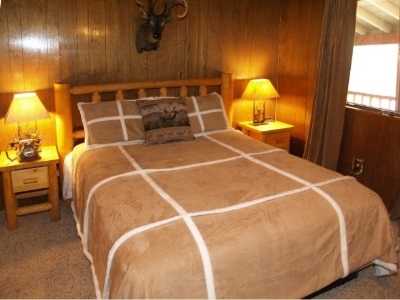 This is a deluxe room upstairs in the main Lodge building. This room is a loft style room. 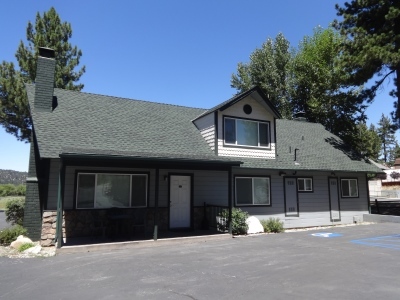 Amenities include a queen size bed, futon makes out to a full in the sitting area, gas log fireplace, full bath, minifridge/micro, TV/DVD. Non-Smoking. No Pets Allowed. 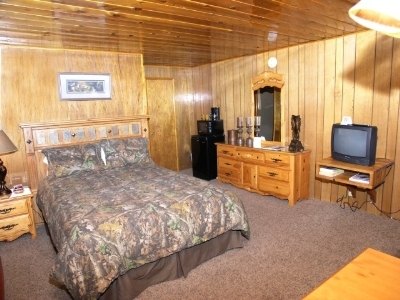 This one bedroom is a stand-alone cabin located on the upper half of our property. Amenities include a queen bed in bedroom and a double futon in the living area, kitchenette, wood burning fireplace, full bath. TV/VCR. Non-Smoking. No Pets Allowed. 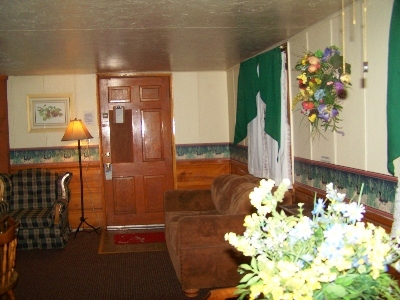 Downstairs is the deluxe spa studio, king size bed, full kitchen, gas log fireplace, full bath, TV/DVD. Connecting door through the kitchen leads upstairs: Queen size bed, double futon, gas log fireplace, full bath, micro/mini fridge, TV/DVD. Non-Smoking. No Pets Allowed. This unit has an extra $50 cleaning fee over the room rate. This additional fee is due at check-in. 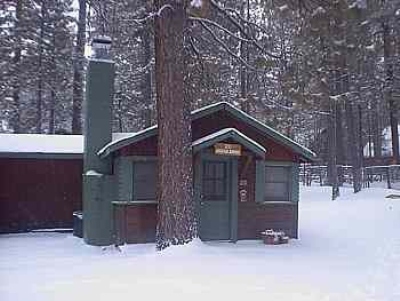 This is a two bedroom stand alone cabin. It has two private bedrooms each with a queen bed. There is a third queen sized bed as well as a double futon in the living area. 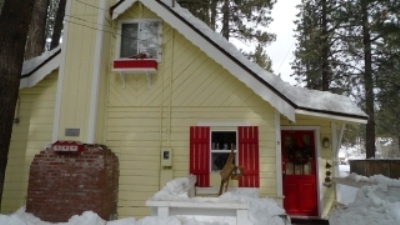 There is a full kitchen, wood burning fireplace, full bath, and cable TV. Non-Smoking. No Pets Allowed. This unit has an extra $50 cleaning fee over the room rate. This additional fee is due at check-in. 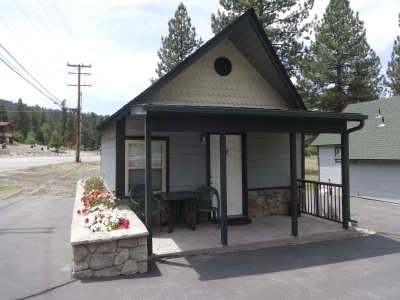 This studio cabin is a standalone cabin located near our common area. Amenities include a queen size bed, wood burning fireplace, full kitchen, full bath, cable TV. Non-Smoking. No Pets Allowed. This is a two story unit in our main Lodge building. Upstairs one bedroom with 1 queen size bed. 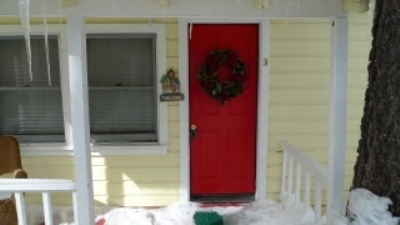 Downstairs 1 double futon, full kitchen, full bath with tub/shower, wood burning fireplace, cable TV. Non-Smoking. No Pets Allowed. 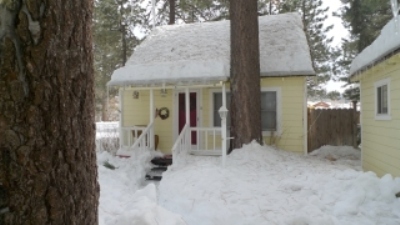 This one bedroom spa cabin is a stand alone cottage located on the upper half of our property. 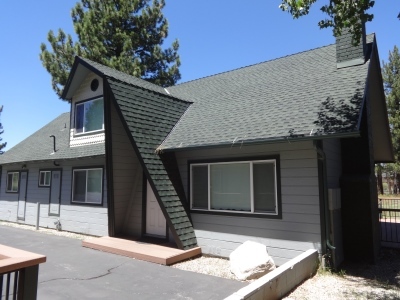 Amenities include an in room jacuzzi tub for two, queen sized bed, this is an open floor plan to the bedroom, wood burning fireplace, kitchenette, full bath, and cable TV. Non-Smoking. No Pets Allowed. 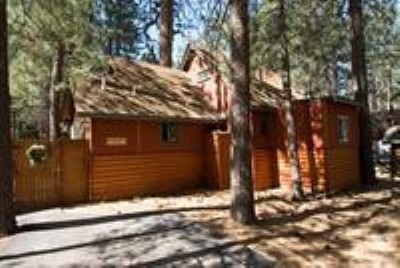 This cabin shares a common wall with 105, Amenities include a queen size bed, wood burning fireplace, full bath, minifridge, cable TV. Non-Smoking. No Pets Allowed. 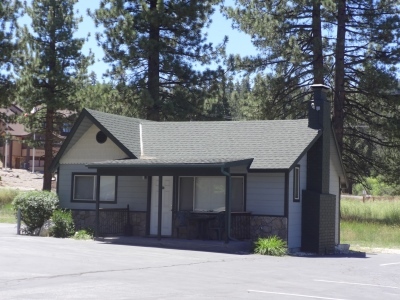 This two bedroom one bath stand alone cabin located on the upper half of the property. The bedrooms have queen size beds. 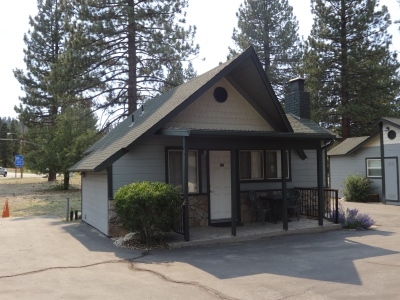 There is one queen size bed located in an alcove off the living room area, along with one double futon, a full kitchen, one full bath, wood burning fireplace and cable TV. No Pets Allowed. Non-Smoking. 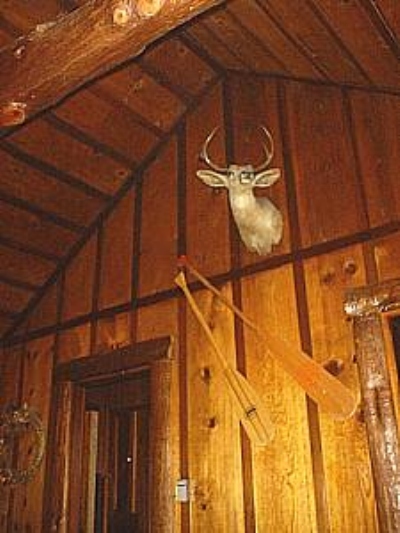 This is a 2 story unit in the Lodge building. 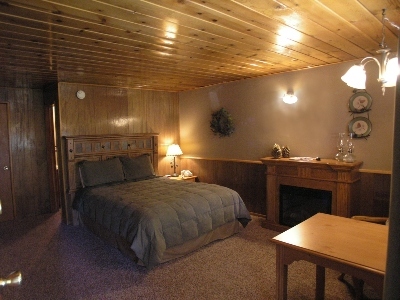 Downstairs is the deluxe in room jacuzzi tub, with a full bath and full kitchen, gas log fireplace, king size bed, cable TV/DVD. The connecting door is through the kitchen along with private entrances if desired. Upstairs there is a queen size bed and two double futons, microwave and mini fridge, a full bath, gas log fireplace and cable TV/ DVD/ VCR. No Pets Allowed. Non-Smoking. A charming newly carpeted and painted room with 2 queen size beds. This room has a patio through a sliding glass door that presents a calming view of the garden. 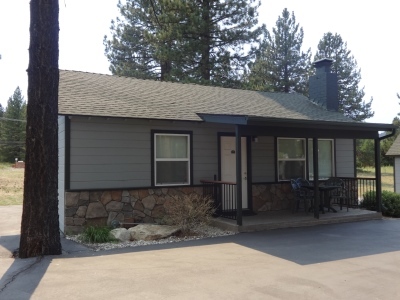 Amenities include a dinette with 2 chairs, fireplace, gas heater, TV with cable &amp; remote, a wet bar sink, coffee maker with coffee, alarm clock, a floor and table lamp, and full bath &amp; shower. This room is pet friendly. 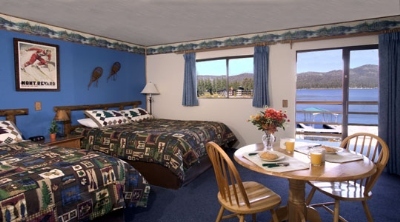 A wonderful newly carpeted and painted lakefront room with 2 queen size beds and sliding glass door. Take in the breathtaking view of the lake and watch the boats pass by as you relax on the large balcony. The room boasts a dinette with 2 chairs, gas fireplace, wall heater, TV with cable, VCR &amp; remote, alarm clock, microwave oven, a wet bar sink, and full bath &amp; shower. This room is pet friendly. Newly Remodeled two room suite. Has full kitchen with a dining room set enough for four. Master bedroom has on queen bed. Guest bedroom has two queens. Living room has a pull out sofa with a gas fireplace and flat screen tv. A beautiful full kitchen suite with 2 queen size bed, a sliding glass door and a charming view of the garden from the balcony. The kitchen is equipped with a small refrigerator, electric range, kitchen sink, toaster, coffee maker with coffee, pots, pans, dishes, glassware &amp; silverware. 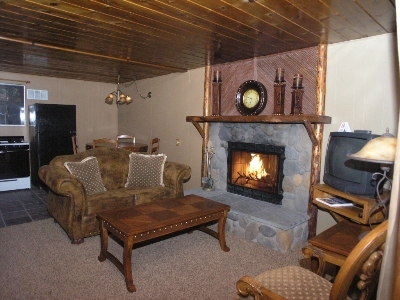 The room has a dinette with 2 chairs, situated in front of the gas burning fireplace. Additional amenities include a TV with cable &amp; remote, an electric wall heater, alarm clock, a vanity wet bar, iron and ironing board, and full bath &amp; shower. 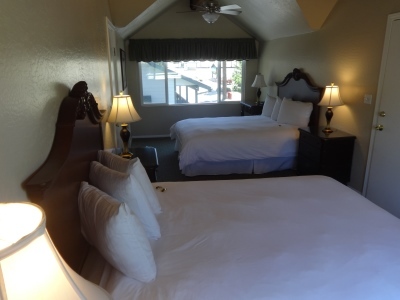 A wonderful newly carpeted and painted lakefront room with a relaxing spa and a 1 king size bed. Take in the breathtaking view of the lake and watch the boats pass by as you relax on the large balcony. The room boasts a dinette with 2 chairs,gas fireplace, wall heater, TV with cable, VCR &amp; remote, alarm clock, microwave oven, a wet bar sink, a mini refrigerator, a sliding glass door, and full bath &amp; shower. Two-bedroom 2-level unit. Upscale furniture. Back porch. This room can be connected to 122 Bedroom 1: One queen-size bed, down alternative&nbsp; comforter with duvet cover, alarm clock. Bedroom 2: Two full-size beds, down alternative comforter with duvet, alarm clock. 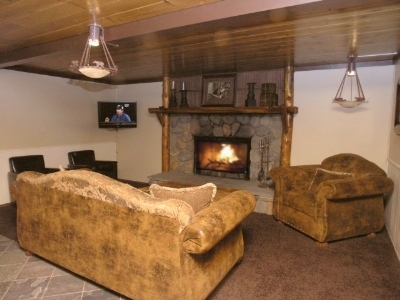 Living Room: Wood-burning fireplace, 40" flat-screen television, DVD player. Kitchen: Refrigerator, dishwasher, electric oven, gas stove top,&nbsp;microwave, coffee maker, toaster, dishes and utensils. Bathroom: Bathtub, hairdryer. Maximum occupancy: 6 persons. PETS ALLOWED -&nbsp;$20&nbsp;fee/pet charged upon check-in. 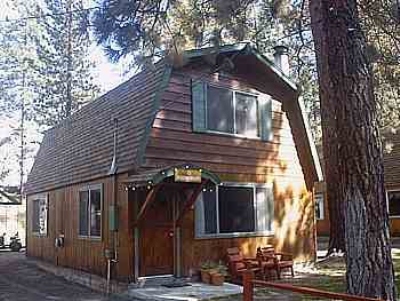 This is a one bedroom one bath cabin located on the upper half of our property. 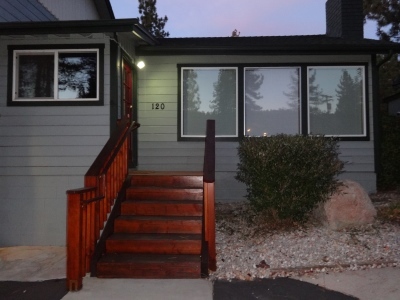 Amenities include a queen size bed in a private bedroom and a double futon in the living room, kitchenette, wood burning fireplace, full bath, cable TV/VCR. No Pets Allowed. Non-Smoking. Pinecone theme room. 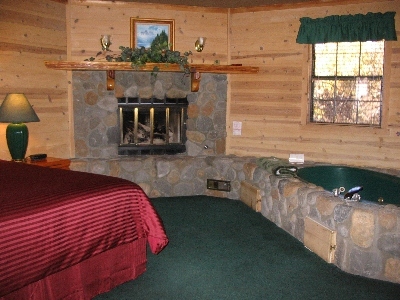 Queen size bed, 3/4 bath, sitting area, electric fireplace, microwave, fridge, and in room coffee maker. Moose theme suite. One bedroom with a queen size bed, full bath, living room with a twin size sofa bed, wood burning fireplace, full kitchen, and dining area. Fishing theme. One bedroom with a queen size bed, full bath, living room with a queen size sofa bed, wood burning fireplace, full kitchen, and dining area. Fall colors is the theme for this room. 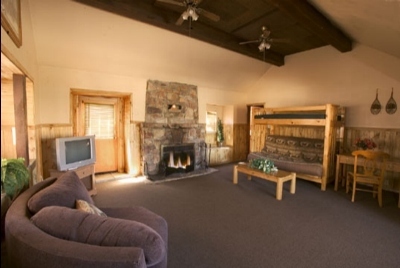 Queen size bed, sitting area, electric fireplace, 3/4 bath, microwave, fridge, and in room coffee maker. 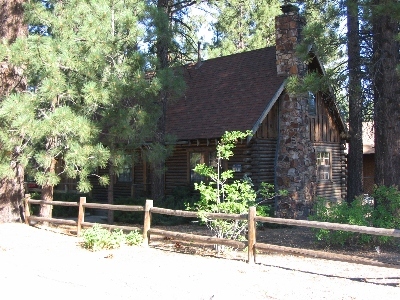 Rustic Pine cabin is one of Big Bear Lake's built in the early years log home. This rustic log home is within minutes of the slopes and The Village and is guaranteed to charm you back into tranquility. The vintage decor is reminiscent of a simpler time. There is one master bedroom downstairs with a king size&nbsp;bed and full bath, living room with a queen sleeper sofa, full kitchen and laundry. The upstairs style loft has another king size bed and two twins separated by the stairs and a bath. There is a surround sound stereo system, Satellite TV/DVD,&nbsp; an original stone wood burning fireplace, and a large fenced yard. 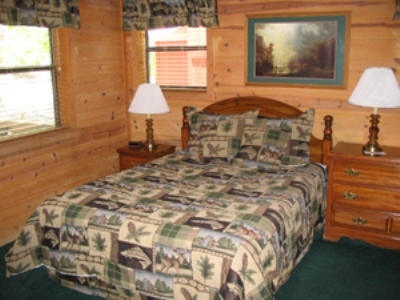 Rustic Pine is the perfect spot to&nbsp;stay and relax and get some good old peace and quiet. No Pets Allowed. Non-Smoking.